What’s the best golf rangefinder to purchase? 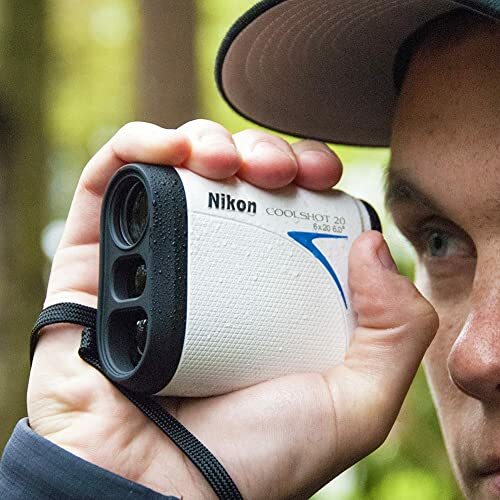 What are the benefits of golf rangefinders? How would a golf rangefinder make you a better golfer? The golf season is up and running, you can find many things out there promising to improve your golf game. And, trust us, a lot of them work. One of the most incredibly handy devices many golfers, both amateur and pro, are using to win the game is a Golf Range Finder or Laser Range Finder. The golf rangefinder lets you survey critical shots, providing you with accurate yardage to specific targets so you can take strokes off your score. This simple device, if used properly, can make a big impact on your golf game, boosting performance and saving a couple of shots each round. A golf rangefinder can be your secret weapon on the golf course, but to get the greatest benefit, it’s important to choose the right rangefinder that makes you a better golfer. There are many golf rangefinders on the market to choose from. Most golf rangefinders come with features including course slope, maximum range and minimum range. Some advanced golf rangefinders come with a variety of extra features, like magnification, pin-seeking, waterproof, and mobile apps. But remember, the best golf rangefinder is the device that you are most comfortable with. Anything that is complicated or fiddly to use is likely to defeat its purpose and become more of a distraction than an aid to your game. Our golf rangefinder review is designed to help you choose the best rangefinder that not only improves your game on the golf course, but also gives you confidence anytime you use it. The Bushnell Pro X2 Golf Laser Rangefinder is our top pick as the best golf rangefinder for most golfers. Engineered with a host of premium features including innovative Slope-Switch Technology, Dual Display Technology, PinSeeker with JOLT Technology, and Slope Compensation, the Pro X2 is the most advanced laser rangefinder to date and it’s positioned as the ultimate golf rangefinder for both amateur and professionals. Slope-Switch technology makes the Bushnell Pro X2 the ultimate laser rangefinder whether practicing or competing, as it ensures the device conforms to local rule 14-3/0.5 when slope mode is switched off. In turn, this provides complete peace of mind for users, allowing them to have the same device for both practice and competitions. Slope Technology also gives the golfer compensated distance based the hole’s incline/decline. There is PinSeeker with JOLT technology provides the golfer with short vibrating pulses to give a tactile confirmation that the laser has locked onto the flag. In addition to these advanced technologies, the Pro X2 laser rangefinder also includes the 2nd Generation of Bushnell ESP (Extreme – Speed – Precision). Bushnell 2nd Generation E.S.P. provides yardage five times faster and more accurately than ever before. Not only has the acquisition speed been increased to a lightning fast level, but E.S.P. also provides ½ yard accuracy from five to 125 yards, and the distance is displayed to 1/10th of a yard. This makes the Pro X2 the most accurate golf range finder we’ve ever seen. However, we pick the Pro X2 as the best golf rangefinder not only because of its ton of great features, this device is amazingly compact, durable and easy to use. All of it is wrapped in a fully-waterproof metal housing. 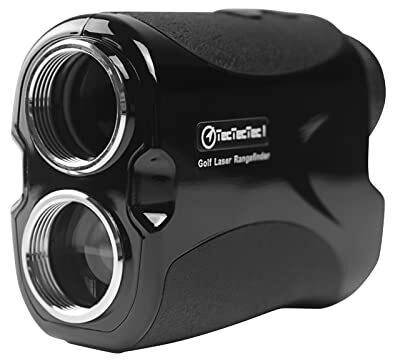 If you play in tournaments, this laser rangefinder easily toggles in and out of the Slope function, so you can turn it off, making it legal during tournament play (today Bushnell Laser Rangefinders are used by more than 90% of PGA Tour pros). You can also easily toggle between a bright red display or a crisp black display depending on your preference to ensure that all the information can be easily read regardless of the light conditions. What’s A Golf Range Finder? In short, a golf range finder is a handheld device that is designed to measure the yardage of a particular shot and can be used to gauge slope. In a typical golf rangefinder, one aims the reticle at the flagstick and presses a button to get the yardage. There has been debate over whether rangefinders should be allowed in tournaments. While their use is banned on some professional level tournaments, rangefinders are becoming widely used on the amateur level. Golf rangefinders emit a laser, which bounces off the object that you’re aiming to hit. They can pinpoint exact elements of the course. Do you want to know how far it is to carry that bunker? What about the distance in front of that pond? If you’re the kind of player that likes to take dead aim at the flag, then a laser rangefinder is the thing you need. The best golf rangefinder units on the market today even offer elevation features that will determine the yardage based on whether the shot is up or downhill. Bushnell Golf’s patented Slope Technology, available in its Pro 2 Rangefinder and Tour V4 Shift Rangefinder, gives golfers compensated distance based on the hole’s incline/decline to help you confidently determine the yardage. So, how do golf rangefinders work? Golf rangefinders are also known as laser rangefinders as they use a laser beam to get distance readings from your target. These devices emit a laser, which bounces off the object that you’re aiming to hit — the pin, for example. Then, they measure the amount of time it takes for the laser to return to the rangefinder. Using this data, they quickly calculate distance to the target object and deliver it to your display screen. Laser golf rangefinders are still the most accurate device for measuring distance on the golf course. The only drawback is they require line of sight and require the act of aiming. We’ve found that it’s very easy to aim at the pin or flag. When there is no wind you can usually get a fix on the limp flag. Even limp, there is a big enough mass there to get a good reading. Even if it’s crazy windy, it still easy to aim at the blowing flag. Some golf courses have reflector prisms on top of the flagstick and those make using a laser golf rangefinder a breeze. Today’s best golf rangefinders can give you the measurement in just a few seconds. Laser rangefinders and GPS units are two very different technologies that serve the same purpose: providing accurate yardages to the target. But which one better suits your game and style? Which one is going to help you the most? There are benefits to both rangefinder and GPS units, depending on what you need as a golfer, as well as your particular personal preferences. Here are a few things to consider to help you pick the best option for you. Golf Laser Rangefinders can measure the distance to any object that will reflect the light beam. That includes most prominent course features like trees, hills, aprons and the faces of bunkers. They also work well on the players in the group ahead. This allows the user to accurately measure the distance to the pin when someone is putting, and on the tee to determine if the next group is safely out of range. Some of the best laser rangefinders also incorporate a measurement of elevation to the target. Golf GPS units, such as the Garmin Approach G10 Handheld Golf GPS, come pre-loaded with thousands of courses worldwide. They display distances to a set of pre-selected points and most provide an aerial view of the hole; some even have a virtual fly-over of the entire hole. This is very useful on an unfamiliar course, giving you a glimpse of the course layout if you’re playing it for the first time. With a GPS unit, you won’t get as precise of a read to the flag as a laser rangefinder. In the right conditions, a golf rangefinder can offer more accuracy than golf GPS systems. With GPS systems, you need the GPS satellite feed to load the content – like other GPS devices such as GPS for trucks. For some GPS units, you need to load the golf course you are going to play prior to leaving your house from your computer. After the unit boots up and locks onto available satellites, you select the course and sometimes have to navigate to the proper hole. When it’s finally ready, the GPS is simple to operate and the information is available almost instantaneously. A golf rangefinder, however, is as simple to operate as a point-and-shoot camera. For us, this is the easiest and most effective way to know yardages. You can simply point and “zap” your target and instantly have a number showing in your field of vision. With a laser golf rangefinder, you can also zap targets on the driving range so that you can figure out how far you’re hitting shots each day (this is something that golf GPS unit cannot do). Plus, some of today’s best golf rangefinders come with optics which allow for greater focus and steadiness as people search for their target. Bushnell, for example, develops “JOLT technology” in all of its laser rangefinder product lines, including Pro X2, Pro XE, Hybrid, Tour V3 and Tour V4 Rangefinder. This provides the golfer with short vibrating pulses to give a tactile confirmation that the laser has locked onto the flag. The vibration alert feature is also available in TecTecTec’s latest rangefinder – TecTecTec ULT-X Golf Rangefinder. The Callaway 300 Pro Golf Laser Rangefinder even uses a technology called “Birdie” that delivers audible ‘chirp’ to confirm distance acquisition to the flag. As of the date of publication, a laser golf rangefinder cost $200 to $500 depending on brands and features, golf GPS units cost $150 to $400. With a laser rangefinder you pay only once, but with some GPS units, there are subscription fees or costs to download courses. With some of the cheaper laser golf rangefinder on the market, it is very difficult to measure to the flagstick from any distance, unless special reflective flagsticks are in use on the course. Though the technology has improved, some laser rangefinders have a difficult time calculating over sand, water and through the rain. Some of the best golf rangefinders have a setting to prevent those unwanted conditions. Keep in mind, capabilities of laser rangefinders can vary by model. The range of most budget golf rangefinders is limited to about 300 yards, but this is not a problem for most players. 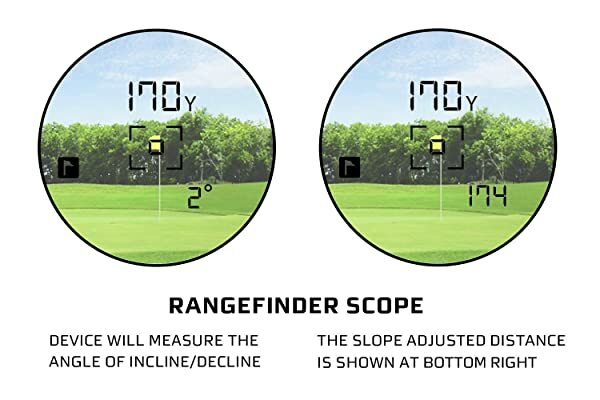 Some long-range golf rangefinders are designed for distances up to 1,000 yards. Again, slope and elevation measurements provided by some golf rangefinders are technically illegal under USGA rules. On a golf GPS unit, the course features, especially those with identified yardages, are only available if the programmer has decided they are important. Some GPS units allow the user to position a cursor to estimate the distance to any specific point, but the accuracy depends on the operator’s ability to locate the cursor. A similar operation is needed to estimate pin positions. Some golf courses may not be in the databases provided on the rangefinder manufacturer’s website. Now, it’s time to take a serious look at some of the best rangefinders on the market. Our detailed reviews will help you narrow down your choice a select the right golf range finder that suits your needs the most. Whether you are an amateur or professional golfer, the Bushnell Pro X2 Golf Laser Rangefinder is the ultimate rangefinder for you. This laser rangefinder is engineered with a host of premium features that make it the most advanced laser rangefinder to date, including innovative Slope-Switch Technology, Dual Display Technology, PinSeeker with JOLT Technology, and Slope Compensation. Slope-Switch technology makes the Bushnell Pro X2 the best golf rangefinder whether practicing or competing, as it ensures the device conforms to local rule 14-3/0.5 when slope mode is switched off. In turn, this provides complete peace of mind for users, allowing them to have the same device for both practice and competitions. Local Rule 14-3/0.5 permits the use of devices that measure distance only (i.e., the device may not be used to measure other conditions such as wind-speed or the slope of the ground). The dual display technology is exclusive to the Pro X2. With the simple press of the Mode button, Dual Display Technology allows the user to easily toggle between a bright red vivid display or sharp black display based on lighting conditions or personal preference. Multi-coated HD Optics with 6x magnification provide yardage accurate to within a half a yard from a range of up to 1300 yards (450+ yards to a flag). PinSeeker with JOLT provides the golfer with short vibrating pulses to give a tactile confirmation that the laser has locked onto the flag. And Slope compensation calculates and adjusts yardage depending on the degree of slope. 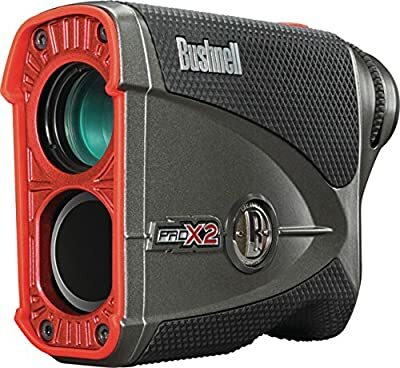 Not only one of the best golf rangefinders you can buy, the Bushnell Pro X2 is also one of the most accurate laser rangefinders. It includes the Bushnell 2nd Generation E.S.P. (Extreme. Speed. Precision) provides yardage five times faster and more accurately than ever any other laser rangefinder we’ve seen. Not only has the acquisition speed been increased to a lightning fast level, but E.S.P. also provides ½ yard accuracy from five to 125 yards, and the distance is displayed to 1/10th of a yard. 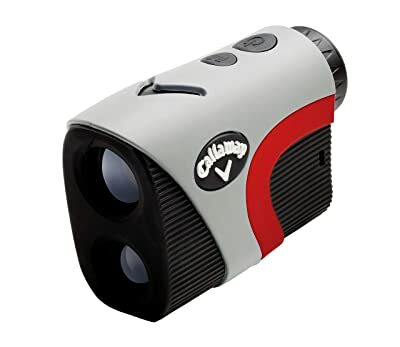 The Callaway 300 Pro Golf Laser Rangefinder is the best combination of quality, dependability, and price. This laser rangefinder is much cheaper than the Bushnell Pro X2 Golf Laser Rangefinder, but it comes with many top features that you might want from the best golf rangefinder, including slope measurement, pin-seeking precision, “Birdie” alert technology, 6x magnification, landscape scan, and a capability of up to 1000 yards. Slope technology is typically available in some of the more expensive golf rangefinders. Most golf rangefinders under $200 don’t have this feature. Slope functionality measures angle of incline or decline then automatically calculates the slope adjusted distance. This function can be turned off with the click of a button for legal use during tournaments. The Callaway 300 Pro Golf Laser uses Pin Acquisition Technology (PAT) to pick out the flag from other objects behind it like trees and it does this as well as others in the market. PAT locks onto the pin from up to 300 yards away, providing accuracy to +/- 1 yard. This rangefinder will sound “chirp” to confirm the device is locked onto the flagstick. Overall, compared to other golf rangefinders that are around the same price the Callaway 300 Pro offers the best value for the money. This golf rangefinder is well made, compact and easy to use. It’s fog proof and waterproof and it also comes in its own protective case with a loop for a bag strap so you can attach it to your bag if you want. The TecTecTec VPRO500 Golf Rangefinder is the best budget-friendly golf rangefinder on the market. Although this laser rangefinder doesn’t come with slope or vibration feature, but it offers clear, multi-layered optical lenses for good visual clarity, 6x Magnification and Diopter Adjustment, Continuous Scan Mode, Pin Sensor Technology, and First Target Priority, ensuring golfers can easily lock onto any object and receive accurate yardage readings almost instantaneously. All these features come in a rainproof sturdy body that is sure to last for years. Compared to other golf range finders at the same price range, the TecTecTec VPRO500 is unbeatable when it comes to quality, accuracy, and ease of use. That’s probably why it gets such great reviews from both beginners and professional golfers. And as you can see, the VPRO500 is currently one of the best selling golf rangefinders on Amazon. This cheap golf range finder is able to measure up to 540 yards within +/- 1 yard. It measures distances perfectly thanks to its clear 6x magnification and multilayer coating. The diopter adjustment functionality will always guarantee you a clear view of whether you’re nearsighted or farsighted. With three different scanning modes, the VPRO500 will give you confidence for every situation. Pin Sensor Technology mode lets you accurately measure overlapping targets, perfect for measuring the distance to the pin and wooded areas giving you confidence in your distance. First Target Priority mode displays the distance of the closest subject, helpful when measuring the distance to the golf flag on a green with woods in the background. And Scan mode, useful when checking the distance of hazards. So, this rangefinder is most suitable to who? 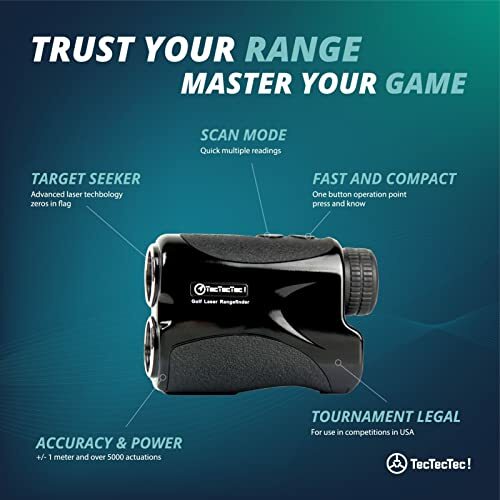 The TecTecTec VPRO500 is the best golf rangefinder for those who don’t need slope function or for those who want a rangefinder for everyday golf practices and don’t want to spend a fortune. The rules of golf permit the use of distance measuring devices under a local rule (Decision 14-3/0.5). The stipulation allows only devices that measure distance, not slope, and other conditions. 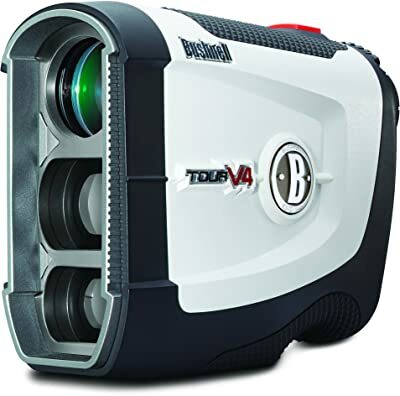 The Bushnell Tour V4 JOLT Golf Laser Rangefinder is the best golf rangefinder to buy if you want to get the advantages of quality and outstanding accuracy of Bushnell laser rangefinders but is always legal to the rule. The Tour V4 JOLT Rangefinder is an upgrade of Bushnell’s highly successful Tour V3 Rangefinder – as the result of feedback from golfers, who routinely suggested that their biggest complaint with rangefinders was being unable to hold their hands steady during use. The Tour V4 is up to 30 percent smaller than the Tour V3 and weighs just 5.6 ounces, making it easy to operate, even with just one hand. The smaller size of the Tour V4 not only makes this possible, but the contoured design of the unit and the rough gripping pads make you feel you are holding the laser more securely. The advantages don’t stop there, the Tour V4 laser rangefinder also retrieves yardages twice as fast as its predecessor thanks to the use of improved processors in the device, and it also has a new focus ring above the eyepiece that makes adjusting focus easier than ever. This device has a range of five to 1,000 yards, it’s accurate to within a yard, and it can target flags as far as 400 yards away, while 5x magnification ensures that players can clearly see and lock in on the right target. Most importantly, the highly popular JOLT technology remains, as the V4 will vibrate when it locks in on the right target, letting players know that they have the correct yardage. Today, Bushnell Laser Rangefinders are used by more than 90% of PGA Tour pros. With the new R&A and USGA rule change, your best bet is a Bushnell laser rangefinder with slope technology. But if you are still reluctant to purchase rangefinders with Slope Technology, the Bushnell Tour V4 is the best golf rangefinder you can buy. 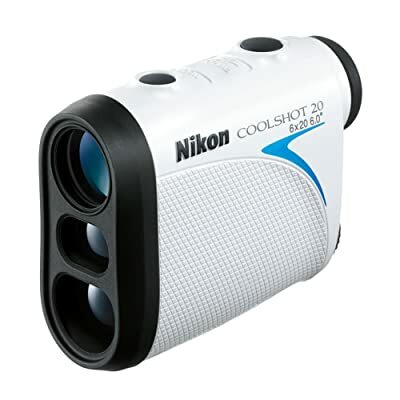 At just 4.4 ounces, 3.6”x2.9”x1.5”, the Nikon Coolshot 20 Golf Rangefinder is one of the smallest and lightest laser golf rangefinders on the market. This gives it a big advantage over most of the other laser rangefinders on the market as it is thin enough to be easily slipped into a trouser or jacket pocket between shots so you don’t have to keep reaching into your bag. The Coolshot 20 features a 6x magnification lens that is accurate to +/- 1 yd. within 100 yards and +/- 2 yds. from over 100 yards with a max range of 550 yards. The lens uses Nikon’s First Target Priority system so that it will always pick out the flag from the background and the distances are shown in 1 yard/meter increments clearly on the screen in good sized numbers. The Coolshot 20 is very easy to use. You just point it at your target and then push the button and the device will continuously range for eight seconds. After 8 seconds it automatically turns it off to save battery power and there is a battery charge meter on the screen to keep an eye on this. You can never say you have ever heard of Nikon – a world leader in optics and imaging products. The Nikon Coolshot 20 delivers world-class performance in a compact and lightweight body. This is the best golf rangefinder to buy if you like a rangefinder that can fit comfortably in your pocket, but packs pack a serious punch when called into action.